How big do you have to be before it’s time to start fussing about your company’s online reputation? Is this something you need to worry about now, or is it better to deal with it once the issue shows up on your doorstep? The goal of every small business website is to dominate Page 1 of Google, Bing, Yahoo, or DuckDuckGo (yes, 4 billion searches in 2016 says we start including DuckDuckGo!) but how you actually make it to the first page is important. You don’t want the reason to be that your company is now embroiled in a scandal. “Branded searches” are ones that include your business name in them, so think of keyword searches like your name reviews, your name your city, your name complaints, etc. If you key those in to your favorite search engine right now, what shows up on the first page? If there’s nothing defamatory or nasty on there, great, but that’s not all you should be looking for. Do you control all or many of those Page 1 listings? 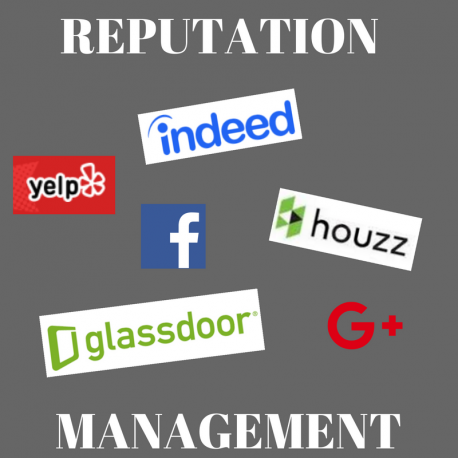 If not, here’s how to take a proactive role in managing your online reputation before someone else puts a dent in it. You should of course already be active on Facebook and other social platforms where your audience likes to hang out. If you’re not, please stop reading now and gently tap your forehead with a hammer. Now go and create any of these “top-tier” profiles you’re missing: Facebook, Twitter, LinkedIn, Google+, Pinterest, Instagram, and YouTube. Snapchat also if it makes sense to your vertical. Upload on-brand images, logos, and other pics. Fill out every line available in your bios and other profile info. Get some initial content on there so your page is not a hollow shell of nothingness - and it’s perfectly okay to cross post the same content on all your profiles for now (but eventually you should have a unique content strategy for each platform). You have flexibility with the next wave of social profiles you create, and try to find ones particular to your business classification – think Houzz (designers, architects), SERMO (physicians), BandMix (musicians) – but be sure to include Reddit and others that are popular and have more universal appeal. Adding the word “reviews” to a branded search is very common now among consumers checking out a business website, so naturally we’re seeing more and more sites like Yelp, YellowPages.com, and TripAdvisor turning up at the top of the search engine results. But sadly, we often see them so prominently for the wrong reason – because the business has gotten complaints. So before that happens, claim those profiles, update them as you would your social accounts and get proactive: get some positive reviews from your customers on there. Once you’ve got a strong presence on a site like Yelp with lots of good reviews, and you’re responding to comments with an excellent customer-first approach it may just make a would-be complainer soften his tone a bit before posting something negative – maybe he even skips leaving a bad review and sends you a Facebook message instead, giving you a chance to make good on his issue privately! There’s another type of review site that many businesses neglect completely (until a problem arises) and those are employment-based reviewers like Glassdoor and Indeed. They are constantly populating Page 1 for branded searches so even if you are your business’s only employee optimize these profiles pronto! What? You have no in-house news team you say? Not needed here; instead we’ve got some great DIY PR tips for our DIY website builder friends. Press releases, as much as Google has tried to devalue their SEO worth over the years, still rank highly in branded searches we find, but normally only ones that are distributed by the more reputable players like PR Newswire and PRWeb.com. FranksSuperOverOptimizedSpamDisseminator.com is probably not going to get you the same results. What to write about? Hate to say this, but it doesn’t really matter (yes, this is heretical but based on a lot of experience!). If you do have a great story like how you just opened a plant and hired 100 employees, go for it – you’ll probably get picked up by a bunch of news outlets and grab yourself some awesome backlinks and maybe a little traffic for your trouble. But you can shoot a little lower too like announcing new products added to your online store, or your CEO’s opinion on the new local tax rates. Another great PR option is journalist outreach. You can sign up on a site like HARO (Help A Reporter Out) and see what kind of contributions journalists are looking for from business owners or subject-matter-experts. Get in touch and you might find yourself quoted on a decent media site, and I don’t think I need to tell you how good that is for your business in general! The online mention on a strong media domain can also mean a top-10 search result for your name, putting your company in a pretty darn good light. Of course you can’t 100% control how the search engines put together their search results, but yes you can influence them quite a bit when it comes to branded searches. If you’re actively promoting a positive image for your company website what else would you include with our action plan above? We’d love to hear from you in the comments!